Dut to its 2 axes slope function, it is available to use for wide range of slope setting. Using included Slope Plate, the slope setting of maximum 25% is possible only with Y axis. Water and Dustproof : IP56　It can be protected from rain and dust. Only putting on is fine. （±８°）　No need of sprit level nor leveling screw. ■Detector and Remote controller are included in the standard set. 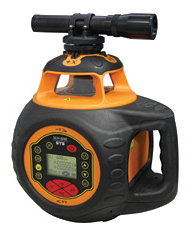 With included Detector, the using range will be wider to about 600m in diameter. Anti-Vibration mode prevents the instrument from stopping rotation by a little vibration at operational site, and keep the leveling continuousely. It can cut the laser beam toward where you do not emit. It will not bother other operators woking in the same operational site. You only push the direction button which you want to stop emission on Remote Controller or Control Panel of the instrument. Rechargeable batteries are included in the accessories. 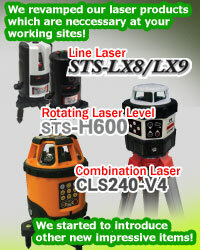 ■Please use together with our Machine Control System HS-360. Power Alkaline D Dry Cell Battery x 3 pcs. Power Supply S-006P(6F22) Layered Dry Cell Battery(9V) x 1 pc. Power Supply AA dry cell battery x 2pcs.